Please accept my respectful obeisances. I am in due receipt of your kind letter dated the 14th instant and I have noted the contents very carefully. I am glad that you have come back to Calcutta from the inundated area of Orissa and am more glad to learn that your holiness is trying to return to Delhi for creating a peaceful atmosphere here. You will be glad to learn that day before yesterday morning at about 9 O'clock Sri N. C. Chatterji the big advocate and President of the Hindu Mahasabha came to our Sangha with his secretary unexpectedly. 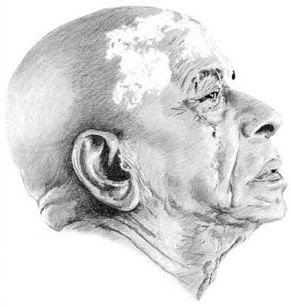 It happened that about a fortnight past we had a Path Kirtana function at his residence at 7-B, Pusa Road and in that evening we had some talk about Sri Caitanya Mahaprabhu. He appeared to be well versed with the matter of Sri Caitanya Caritamrta. I therefore invited him to come to our Sangha and he replied that he would try. After a week I reminded him again by letter and in response to my letter he came here all of sudden. Practically all the members were out at that time and myself along with two other Brahmacari and Brindaban received him. He was acquainted with our activities and was offered Prasadam which he accepted and took it with him. I have asked him to come again when your holiness come back. Regarding your instruction for Spd Akincana Maharaja, I have intimated him about it and it is learnt that he has asked Sripada Bonbehariji to bring along with him the old receipts when he is coming to Delhi. Your note for Sriman Kesavanandaji has also also been noted by him. All the press matters for September issue have been duly handed over to the Kapoor Art Press but till now we have not got any proof from them. I sent for it this morning and they have promised to deliver it from tomorrow. It is learnt from Kesavanandaji that they have promised to finish the task by the 25th of this month. I have noted your remark about the cover of the monthly and I have already suggested so many things to Sripada Ramananda Prabhu for apprisal. Sripada Ramananda Prabhu and many others along with me want to see the paper just fit for the foreign countries. In that case we must get it printed on nice paper in a very good up-to-date Press. It all depends on the expenditure that we are able to meet but the ideal must be for its many sided desirable improvements. When you come back we shall see to it because in your absence it is not also possible to change the press. When we cannot change the press immediately it is useless to change the paper or the cover. The suggestion made by some friend that the paper may be printed from Calcutta is alright. But my suggestion is that either in Calcutta or in Delhi we must have our own press with good equipments so that we may be able to broadcast the message of Sri Caitanya Mahaprabhu in all the important languages specially in Hindi and in English. Hindi is meant for all India propaganda while English is meant for world wide propaganda. This day we have received two copies of "Gaudiya Darshan" from Sripada Sridhara Maharaja's Math at Navadvipa. The starting is very good and I have quite appreciated the endeavour of Sridhara Maharaja even though very late. It is better late than never. He has a very good assistant in the person of young Govinda Maharaja and I think it is a good attempt. Regarding Typewriter machine I understand that Sripada Ramananda Prabhu is unwilling to part with it. Of course in his head office of the institution he requires one for so many correspondences but here also in the office of Sri Sajjanatoshani Patrika which purely in English one machine is absolutely needed. Here all the presses do want type written copies so that the matter may be promptly executed. Some of the presses are ready to finish the whole printing work within 4 or 5 days if the whole matter is given in distinct type written papers. This machine was hired and I have already informed you about it. We have in the meantime type written three copies of all the addresses so that for three months we can simply paste the addresses on the covering wrapper without taking any trouble of clerical job. Any way we shall see to it when you come back if possible with the machine.